High household indebtedness weighs on private consumption, and exports are affected by the slowdown in China. The current government is expected to remain in power until the next elections due in 2017. The government of president Park is pursuing a business-friendly policy, while also paying some attention to inequality reduction and social welfare. The relation with North Korea remains very sensitive but is not expected to escalate. Economic ties with China are getting stronger, with a bilateral free trade agreement signed this year. 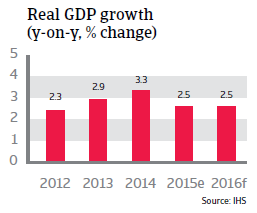 After increasing 3.3% in 2014, South Korea´s GDP growth slowed down to 2.5% in 2015, mainly due to decreasing exports (cars, electronic components), which account for about 50% of the country’s GDP. 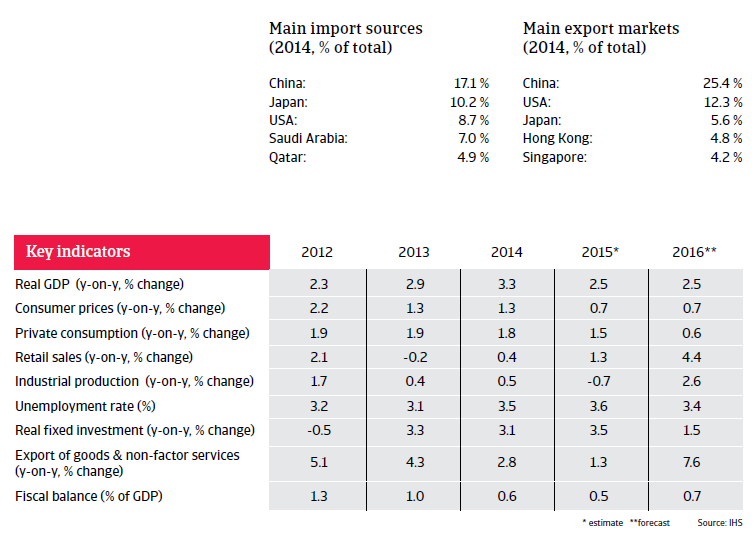 Exports were negatively affected by decreasing demand from China (South Korea´s largest trading partner) and a loss of competitiveness with Japanese businesses in key export markets due to a rise in the won against the Japanese yen. (Japanese firms are the biggest competitors in electronics and car making, among other businesses). 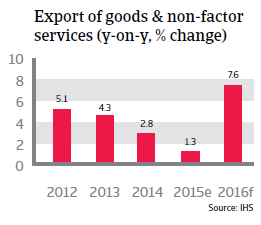 Net exports turned negative and industrial production contracted in 2015. It appears that South Korea’s economic model: export driven and dominated by chaebols (the South Korean form of business conglomerate) is no longer capable of providing sufficient employment and purchasing power growth. Korean households are, on average, highly indebted (about 160% of disposable income), and this weighs on private consumption and on the health of the financial sector. In order to spur consumer sentiment and support exporters, the Bank of Korea has cut its key interest rate several times since the end of 2014, down to an all-time low of 1.5%. Inflation decreased to 0.7% in 2015, well below the central bank’s target of 2.5% - 3.5%. The government has increased public spending to support the economy. 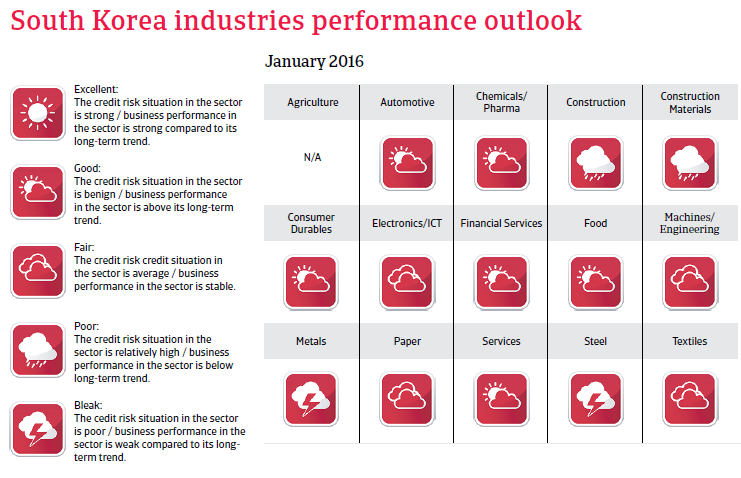 South Korea is seeking to move away from export-led growth to growth driven by services and domestic consumption. Reform of chaebols, the deregulation of both the labour market and service sector and more support through loans and technical expertise to small and medium enterprises (SMEs) should help to increase competitiveness and support growth. The low public debt level (36% of GDP in 2014), low external debt and consistent current account surpluses provide the South Korean government with flexibility in times of adverse economic conditions and provide some protection against international investment volatility.